Vacation homes are all about escape and relaxation. Some families prefer the recreation afforded by being near water, choosing beach houses and lake cottages. Others favor the solitude of secluded spots like mountain cabins or desert ranches. Vacation home decorating ideas generally start with a base of comfort and informality and are rounded out by the owner's personal style. The most important inspiration often comes from the nature found near the homes. For example, blues and aquas are popular accent colors for homes at the beach and lake, bringing the color of water indoors. Mountain cabins incorporate woodsy browns and deep pine greens, where desert ranches begin with the Southwestern trinity of sandy beige, rusty terracotta, and turquoise. No matter the setting when furnishing your vacation home, remember that you’ll want to incorporate accommodations for guests. This means extendable tables to fit extra dinners, extra seating in the living spaces, perhaps a pull out sofa, and bunk beds in the kids rooms. Decorating a beach house or lake cottage is all about letting the view be the star of the show, which is why neutral white is a common dominant color. It is light, airy, and does not detract from the water scene. These houses often incorporate nautical themes to further underscore the water presence, from shells and sea glass to rope lines and netting. Because lake cottages are often in wooded settings, this creates additional decor inspiration. Lake cottage owners can incorporate darker wood and go for a lodge look and feel. Common furniture styles found in beach house and lake cabin vacation homes include casual, bohemian, country, cottage, floral, shabby chic, and vintage. The idea is to take inspiration from the ocean or lake and bring it into the house. This could take form as vertical pylons that support a dock translating into picket fence accents on cupboards or the sweeping curve of boat sails being mimicked in the arched back of a couch. A cabin in the mountains can be as spartan or luxurious as the owner's heart desires, though decor is typically casual and rugged. 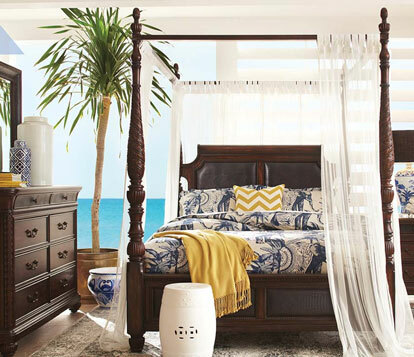 Appropriate furniture styles for this vacation home include rustic, traditional, artsy, Tuscan, and distressed. Popular fabrics are leather, flannel, denim, wool, and, used sparingly for maximum impact, animal patterns such as cow, bear, moose, and deer. Wood as close to its natural state works exceedingly well, with nicks and knots bringing personality. Accent pieces can draw inspiration from animal horns, driftwood, logs, leaves, and wrought iron. Modern touches in glass and steel provide a focal counterpoint and insert personal style. Vacationing in the mountains often means taking part in winter activities like skiing and snowmobiling. Keep this in mind when decorating and choose furniture, rugs, and fabrics that won't mind melting snow or the heat from a roaring fire. Cozy, overstuffed sofas and chairs provide the warmth and comfort desired after an exhausting day in the snow. Many people think of deserts as sandy and barren, but true denizens know these vistas offer the widest variety of vibrant colors of any vacation destination. The look of a home in the desert is inspired by the red grandeur of the mountains, the rainbow pop of desert flowers, greens and blues of cacti, and the patterns, hues, and textures found in native rugs and art. Flooring is typically tile, concrete, or wood. Furniture styles are usually casual, modern, rustic, and industrial. Natural, tactile fabrics work best, such as leather, tapestry, burlap, and cotton. Protect furnishings from the punishing afternoon sun with a mixture of shades and curtains. The clarity of the night sky is sometimes overlooked when decorating desert vacation homes. Away from city lights, the skies are a deep, midnight blue dappled with a star show of twinkling lights. This opens up opportunities for outdoor living beneath the greatest canopy nature has to offer. Consider stocking a patio with comfortable outdoor furniture and a fireplace for the cooler desert nights. Build an outside kitchen to take full advantage of the dry weather and maximize time in the open.